Written by Mark Selden and Jenny Chan. By some measures China surpassed the United States in 2014 to become the world’s largest economy. It did so amidst widespread labour and social tensions. Central both to China’s economic resurgence and mounting social conflict are rural migrants, who have experienced incomplete proletarianisation in that they possess agricultural land-use rights while working as hired labourers in urban and semi-urban areas. By early 2016, 277 million rural migrants had been drawn into industrialisation and urbanisation, an increase of 52 million since 2008, when the government began publishing online annual survey results on work and employment conditions. While China has the world’s largest number of internal migrants, the rate of growth of rural migrant labour has declined from 5.4% in 2010 to 1.3% in 2015 in step with tightening labor markets and demographic transition. While many first generation workers migrated to special economic zones to work for a few years before returning to their villages to marry and settle in the early years of the state-guided market reform, younger and better-educated cohorts express a hope to broaden their horizons and experience a modern and prosperous life in the city. As of 2013, 47% of rural migrant workers were born after 1980, and the majority (61%) had completed nine years of formal education. An additional 20.5% are high school graduates. But rosy dreams of high tech work or entrepreneurial success collide with formidable problems including permanent minimum wage jobs, inability to obtain technical training, soaring income gaps and limited access to affordable social services such as public housing, education, medical care and pensions. One critical issue is non-payment of social insurance for rural migrants. When the central government promulgated the Social Insurance Law, effective 1 July 2011, it required employers and employees to co-contribute to social insurance on a monthly basis, with premium contribution payments by the company as well as by workers made portable throughout the country. The accumulation (15 years of payments were required before any disbursement of retirement benefits) and continuity of insurance enrollment is important under conditions of high labour mobility. But this is a goal that has yet to be fulfilled for many employees. In 2013, the government estimated that only 28.5% of rural migrant workers were covered by work-injury insurance, 17.6% by medical insurance, 15.7% by old age pensions, 9.1% by unemployment benefits, and 6.6% by maternity insurance. In export-oriented industries, students from vocational schools are recruited in the name of “internships” to work alongside migrant and local employees. Interning students, who are part students and part employees seeking to fulfill graduation requirements and gain specialized training, are excluded from the government-administered social insurance schemes. The extensive use of informal and migrant labour in China, as in many other countries, is characteristic of the neoliberal era in which scores of millions of laid off state sector workers, a new precariat, now compete for jobs with rural migrants. Nevertheless, minimum wages for workers have risen significantly over the last decade. By 2012, “real wages for migrant workers were two and a half times what they had been in 2003, increasing by 10.8 percent annually.” Multiple factors explain this trend. In the mid-2000s, the government abolished the agriculture tax and introduced new social insurance schemes to raise rural incomes in reaction to the widening urban-rural income gap that worsened from 2001 when China joined the World Trade Organization resulting in downward pressure on agricultural prices. For the first time, a shortage of young workers, including migrants, has reportedly emerged in coastal export zones, and will soon occur in booming interior cities, where investors seek lower-cost labour, land, and other resources under the Go West macro development policy. These factors, plus increasing labor protests together with younger workers’ high job mobility, compel employers to raise wages to recruit and retain workers. At the same time, the state has been raising minimum wages to rebalance the economy and to stimulate domestic demand. Government surveys show that in 2015, Chinese rural migrant workers’ average wage was 3,072 yuan/month (including overtime premiums), a 7.2% increase from the preceding year. In response to tight labor markets and lower wages in peripheral areas, factories are relocating inland and offshore in the search for cheaper labour, spurring waves of protests over layoffs, involuntary transfers, and inequitable contract terms. Young migrant workers, the backbone of the nation’s economic development, frequently experience frustration as they aspire to develop technical skills, earn higher wages, enjoy comprehensive welfare, and hold the full range of citizenship rights in the towns and cities they inhabit. 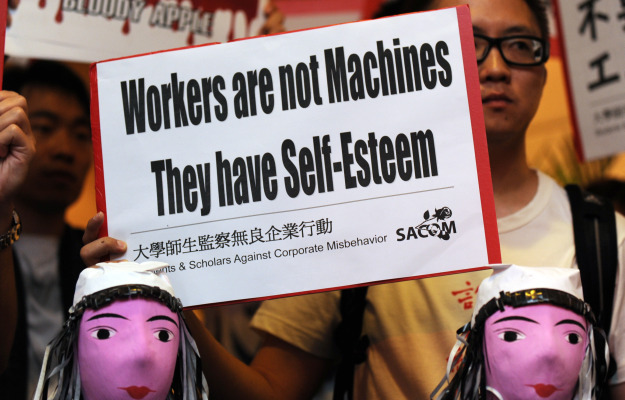 China has become not only the workshop of the world, but also the epicentre of labour unrest. Increasingly, aggrieved workers are taking legal and extra-legal actions to defend their interests in the absence of leadership by trade unions. Based on our field research of Taiwanese-owned Foxconn Technology Group and other scholarly studies in China, we highlight the fact that at key nodes of production, the integration of large manufacturers in transnational supply chains and tight delivery schedules for electronic and other consumer products have enhanced workers’ bargaining power at the workplace level. With workers’ growing awareness of the opportunities presented by the fact that giant corporations face pressures to meet quotas for new models and holiday season purchases, they have repeatedly come together at the dormitory, workshop, or factory level to voice demands or to stage protests. Access to internet and social networking technology also enables workers to disseminate open letters and to tweet urgent appeals for support. Thus far, collective labor actions are mostly short-lived and confined to a single workplace or an industrial sector. If some of these struggles have resulted in limited wage gains, the harsh reality remains that worker victories have not translated into long-term gains in the form of unions responsive to labour or the emergence of a movement with a comprehensive labour agenda. Following the recent state-led repression of worker leaders and their supporters in Guangdong, where internal migrants have been forging active cross-border links with non-governmental organizations, the prospects of mainland Chinese labour activism remain problematic. Mark Selden is a Senior Research Associate at the Asian/Pacific/American Studies Institute at New York University, Professor Emeritus of Sociology and History at Binghamton University, and Editor of the Asia-Pacific Journal. 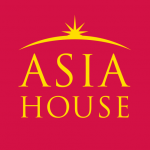 His books include: China in revolution: The Yenan way revisited; The political economy of Chinese development; Chinese village, socialist state; Chinese society: Change, conflict and resistance; and, The resurgence of East Asia: 500, 150 and 50 year perspectives. Jenny Chan is an Assistant Professor of Sociology at the Hong Kong Polytechnic University. She is co-author of La machine est ton seigneur et ton maître (with Yang and Xu Lizhi, Agone, 2015) and of Dying for an iPhone (with Ngai Pun and Mark Selden, Rowman & Littlefield, forthcoming). Image credit: SACOM (Students and Scholars Against Corporate Misbehavior). What happens when migrant workers suffer injury?